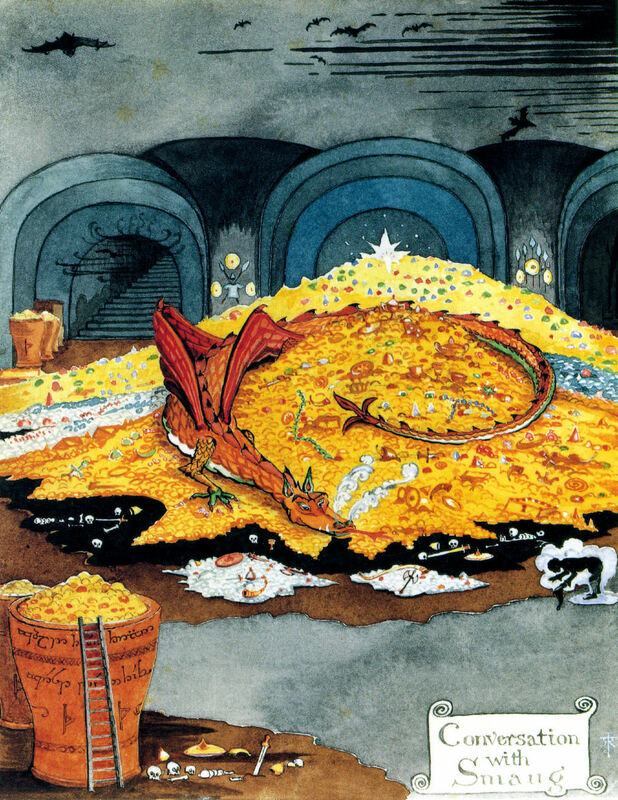 This Christmas Peter Jackson will release the first of a trilogy of films based on J.R.R. Tolkien's The Hobbit. 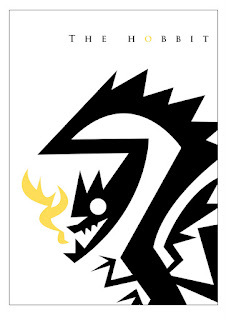 (Yes, yes, it's a short book so how there are going to be three movies...we'll all have to wait and see.) Even though there are trolls and Gollum and shapeshifters and dwarves and elves, the central antagonist in the story is Smaug the Golden, Smaug the Magnificent... Smaug the Dragon. 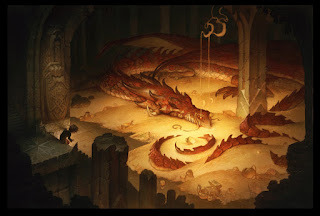 Almost certainly inspired by the unnamed dragon—"old night-scather—who kills Beowulf, Smaug is similarly reptilian, winged, breathes fire, and jealously guards his horde of stolen treasure inside the Lonely Mountain. 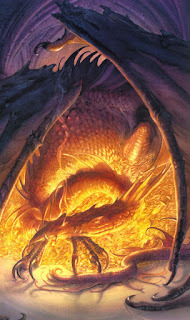 And just as Smaug had his roots in the Beowulf poem and other beasts from classic mythology, he in turn certainly inspired the legion of dragon villains that followed in innumerable D&D adventures and films like Disney's Dragonslayer (which itself has become the template for most contemporary filmic mosnsters). 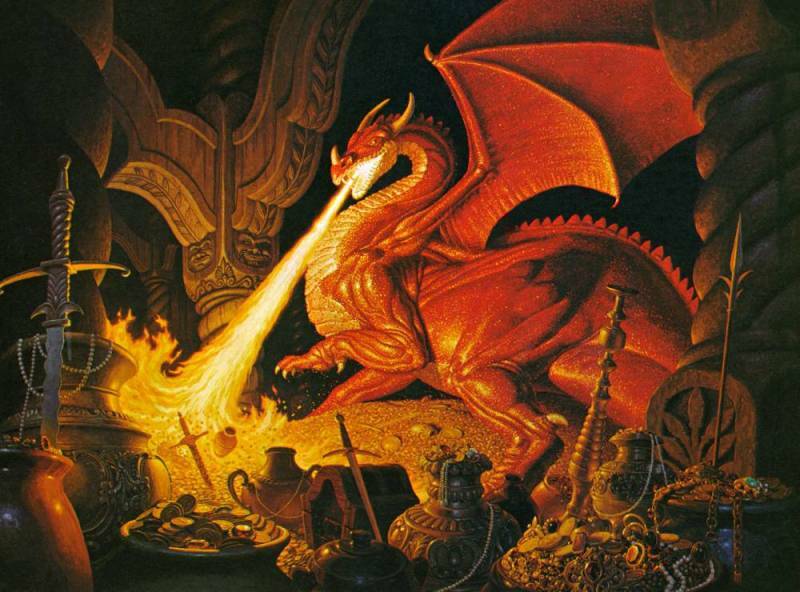 Smaug has been the subject of numerous paintings over the years, including some outstanding examples by some of my fellow Muddies. A few examples follow. Above: Tolkien's own painting of Smaug's coversation with an invisible Bilbo. 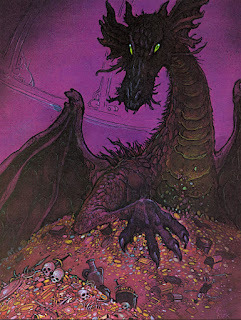 Above: Tim Kirk was the first artist to illustrate a Tolkien calendar; originally painted as his Masters Thesis, all of the art was purchased by Ian and Betty Ballantine for both the calendar (which sold over 250,000 copies) and for their private collection. 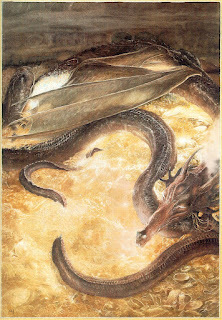 Above: Greg and Tim Hildbrandt brought a realist's style to Tolkien's world with their multople calendars. 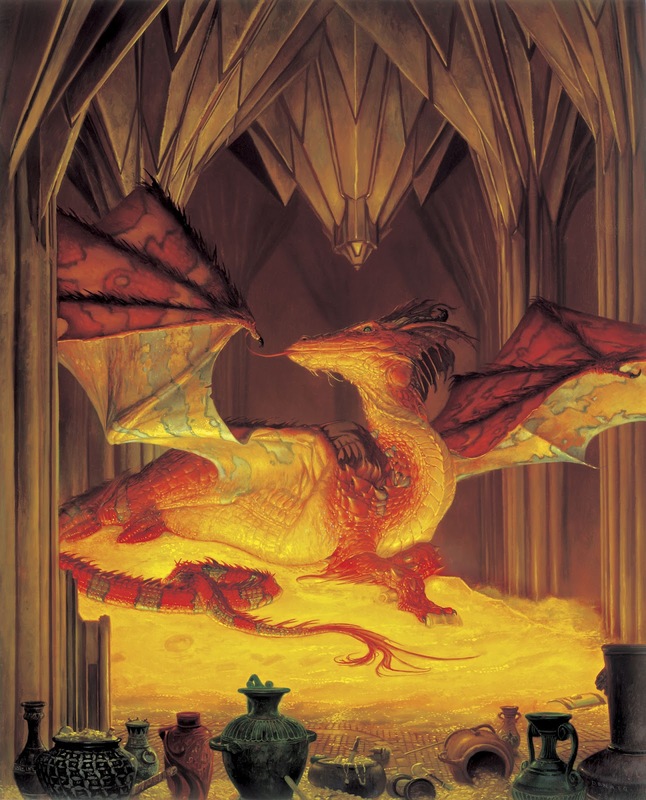 This painting of Smaug was one of their best. Above: "The Secret Thief" was one in a series of Tolkien-inspired posters Stephen Hickman painted for Christopher Enterprises in the 1970s. 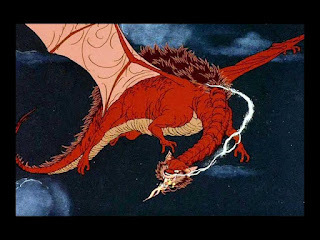 Above: Smaug was depicted a bit more mammalian with fur and a wolfish head in the Rankin-Bass animated adaptation of The Hobbit. Above: Alan Lee's cover for the illustrated edition of the novel is stunning—which is hardly a surprise. Above: Likewise, Donato Giancola's is simply luminous—though I'd very much like to see him take his drawing of Samug, viewed from below, flying over Esgaroth to finish as an oil. I'm sure the results would be equally amazing. Above: Similarly, John Howe's Samug sleeps atop a mound of gold that positively glows, but the coiled neck and framing wings give the painting an appropriate hint of the dragon's evil and menace. Weta turned this into an equally lovely statue. Above: Ah, Justin Gerard. He mixes watercolors with digital refinements seamlessly to create truly astonishing works. 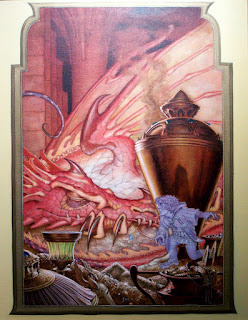 Bilbo's tiny figure drives home the danger the hobbit is facing. Above: Finally, an experimental graphic treatment by Shane, who describes himself as "the only Award Winning Illustrator you've never heard of." True or not, I really like this.